HEMPHILL, John, (uncle of John James Hemphill and great-great-uncle of Robert Witherspoon Hemphill), a Senator from Texas; born in Chester District, S.C., December 18, 1803; attended the common schools; taught school; graduated from Jefferson College in 1825; studied law; admitted to the bar in 1829 and commenced practice in Sumter, S.C.; edited a nullification newspaper in 1832 and 1833; second lieutenant in the war with the Seminole Indians in 1836; moved to Texas in 1838 and practiced law; elected judge of the fourth judicial district of Texas 1840-1842; adjutant general on a military expedition to the Rio Grande in 1842; member of the state constitution convention in 1845; chief justice of the supreme court of Texas 1846-1858; elected as a Democrat to the United States Senate and served from March 4, 1859, until his expulsion by Senate resolution on July 11, 1861; representative of Texas in the Congress of the Confederate States of America until his death; died in Richmond, Va., January 4, 1862; interment in State Cemetery, Austin, Tex. American National Biography; Dictionary of American Biography; Curtis, Rosalee. 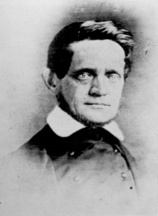 John Hemphill: First Chief Justice of the State of Texas. Austin: Jenkins Publishing Co, 1971.